Explorez les Catacombes de Paris lors d'une visite en petit groupe limitée à six personnes. Grâce à cette entrée coupe-file, vous pouvez éviter la longue file d'attente de billets dans l'une des attractions les plus fascinantes de Paris et découvrir l'histoire d'un site de sépulture souterrain avec un guide. Although it is a bit expensive having someone guide you through the catacombs while explaining the purpose and history helps you understand how and why they were created. The tour also gives you access to portions of the catacombs not allowed by non guided visitors. Our tour ended up being private as we were the only one signed up for that time. The tour lasts about 2.5 to 3 hours. Very interesting and informative great guide. Like I said so worth the money. Amazing tour and amazing guide. Would highly recommend the smaller group setting!What a unique experience. Amazing!!! Great guide super easy to understand. super informative. Be ready to walk 100's of steps. There are literally 189 steps to get out of the catacombs. There are no elevators so beware. Make sure you skip the line with a tour guide or you will be waiting a long time. They will only let in a certain number of people at a time. Our tour guide Ferrit was amazing! 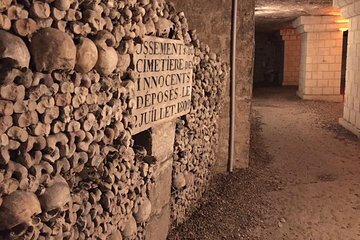 He shared so much history about the catacombs and Parisian history. The restricted access was a highlight. Cant thank our guide enough for making our experience amazing! This was an ACTUAL Skip the Line tour! It was on time and our guide Ferrit made the 2 hours incredibly interesting! Worth every penny to see the boneyard - just awesome! I highly recommend this. Our guide, John, was absolutely awesome and worked our group (ages 7, 17, 17 and adult) perfectly. He was charming and knowledgable and really made our experience educational and fun! Thank you! !